We all have our own version of paradise, don't we? For some, it's a mai tai in one hand, a good book in another, and sun-warmed sand at our feet. But for a certain JIG subset, it's a bit different: a cold half-drank mochachino on the desk, the happy hum of a computer in front of us and another lovely game from Robamimi. Aw, yes! The Seeds of Eden is a welcome sight to all us devoted escape game fans as well as to anyone looking for a brief diversion from the mundane world. After selecting your preferred language (Japanese or English), click start and you'll be transported to a vine-shrouded courtyard garden. It's pretty, but what you really want is to see what's beyond those high stucco walls. To do that, uncover the clues needed to solve a short series of puzzles and find the key to that forbidding metal door. Your pointer will change when an obtainable object or interactive area is within clicking range, but you should also rely on your eyes to seek out interesting spots and useful information. The interface is very intuitive, making finding your way around and utilizing objects quite easy. Robamimi continues to be user-friendly with a "Hint" and "Save" button in case you ever feel stumped. As you explore this tiny garden, the mood and setting elicit a sense of Hermit Rabi and Wonder Fountain but on a smaller scale. Depending on your experience with playing this sort of game, your stay in this miniature Eden can be disappointingly brief, especially considering that none of the puzzles require stretches of logic or lateral inferences. Nevertheless, it's always a joy to play a Robamimi creation: they're always infused with a bit of indescribable magic that takes you away from the moment, even if only temporarily. The magical allure of The Seeds of Eden is in its slightly surreal surroundings and pixie-like melody which coax your imagination while you unhurriedly unravel the riddles set before you. The teasing scene at the end might tempt you to daydream a bit more, as well. Proust is known for his quip, "The only paradise is a paradise lost." Yet, in this case, it's an Eden escaped! Not loading? Try the alternative link: The Seeds of Eden. 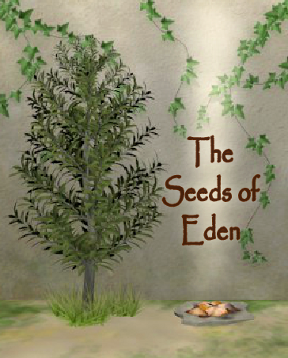 The Seeds of Eden Walkthrough now available! You begin facing a locked door and a "Wonder Fruits Garden" sign. Pick up the BUCKET (EMPTY). Note that there's something glinting in the vine at the top, left side of the wall. You'll need something to reach it. Turn left. Here there's a large panel in the wall and a small grey table. You need a 3-digit number to open the drawer. Based on what you've seen so far, you can figure out the code. The design on the top of the table refers to the "Wonder Fruits Garden" sign. Use the dots on the design to select letters on the sign. Enter that code into the front of the table and click "OK". Close the knife detail. Back up from the table. Turn left again to see a deep trough and a podium. Close bucket detail and back up from the trough. From the picture on the top of the podium, it appears this controls the water trough, but there is no way to operate it at the moment. Back up from the podium. Turn left to face the tree. Notice that the sun shines down on a pile of leaves and acorns. Nothing more to do with it for now. Use the BUCKET of WATER on it. Now, there is a pale green fruit on the tree. Zoom in on the fruit. Use the KNIFE to cut it from the tree. Close the DIAMOND STONE detail and back up twice. Turn right and examine the podium again. Place the DIAMOND STONE on the yellow diamond on the podium. Click it to turn it toward the "empty" icon. An animation will show the water draining from the trough. Close up on the trough again and follow the ladder to the bottom. They look like numbers stacked on top of each other. Take note of the design. Pick up the MAGNIFYING GLASS. Close out the detail screen and back up. Then click on the ladder to begin your climb up to the surface and click the up arrows two more times to reach the top. Back up from the trough. Click "OK" and the panel will open, revealing a passage. It's too dark to see inside the passage. Now what? Pick up the white CANDLE from the ground, just inside the passage way. Turn left twice and zoom in on the pile of leaves and acorns, a fire pit "lighted up by the sun." Use the MAGNIFYING GLASS to start a fire. Use the CANDLE on the fire to light it. Turn around twice and use the LIT CANDLE on the darkness to light the passageway. There's a square cabinet door in the passage wall, but it needs a key to open it. Where would a key be hiding? Maybe poking around with the stick would help? Go back into the garden and turn left to face the wall with the Wonder Fruit sign and locked door. Turn left and re-enter the passageway. Zoom in on the box in the wall. Get the PLANT MAGIC:SUPER GROW bottle out of the cabinet. Turn right to explore the far end of the passage. Here, there's a 3x3 grid of letters. Note that the clue in the upper right corner. Back up once and turn left. Exit the passage and go back into the garden. Now you need to do a few more things with the podium, tree and fire. Turn right, go over to the podium, and click the diamond to fill up the trough again. Next, fill the BUCKET up with WATER out of the trough again. Turn left, back to the fire and use the BUCKET OF WATER to put out the fire. Take a closer look at the ashes in the empty fire pit. Now you have another clue: "Symmetry." Focus on the base of the tree. Use the PLANT MAGIC on the tree. Back up to find another FRUIT in the tree. Use the KNIFE to remove the FRUIT then use the knife again to cut open the fruit. Get another DIAMOND SHAPED STONE. Back up, turn right twice, and go back inside the passage. Use the clue from inside the empty fire pit to work out which letters to push. Look for symmetry amongst these letters. Letters that are symmetrical are unchanged if you flip them. Light up the correct letters and click "Enter". The wall panel will open to reveal another podium. Go forward to this second podium. Make note of the clue: "Trace Vines." Put the second DIAMOND STONE on the green diamond. If you click the diamond now, switching it to "close" then back up and turn left, you'll see the passage opening has been sealed off. On the sealed up passage entry, there is a 4x4 square grid. The top row of buttons are lit. The clue "Trace Vines" tell you how to solve this one. Go back to the new podium and click the diamond to "Open" the entryway again. Notice how some flowers are higher than others? Trace the vines to figure out which is first, second, etc..
Go back into the passage, to right and return to the second podium. Turn it to "Close". Back up and go left to see the 4x4 grid on the closed up passage door. Light up one button for each row, as indicated from tracing the vines. Top row: do nothing (to leave last button lit). Second row: click third button. Third row: click first button. Last row: click second button. Click "Enter" and an animation will indicate the trough filling with pink water. Now that you've solved the 4x4 button grid, turn back to the podium at the end of the passage, re-open the entry, and exit out into the garden courtyard. You're ready to complete the final steps for the EXIT KEY. Turn right and examine the trough of pink water. Fill up the BUCKET with PINK WATER. Close the detail screen, back up, and turn left. Examine the base of the tree and use the pink water to water the tree. Now a PINK FRUIT has grown on the tree. Take the KEY then close out of the key detail. Turn left and use the KEY to open the door. Congratulations, the door is open. Fairly easy. But pretty good.
. That must be referring to the sign. Too many letters for an anagram solvable by me. If you haven't opened the desk yet, the Hint is referring to the clue on the desk, which narrows down the letter options a bit to give you the numbers for opening the desk. Aaaah, of course. Simple when you tell me!! Thx!! I have to say, I think this might be one of Robamimi's best escapes yet. The balance of the difficulty of the puzzles was about as perfect as I could ask for; not too easy that I don't have that feeling of "Ha! Got it! :D" , but at the same time not so difficult that said feeling has a headache accompany it. That, a nice soothing atmosphere, and no traces of pixel-hunting added up to this being just about perfectly done. Bravo, Robamimi, bravo. You water the tree and this fruit instantly grows, and it has a mechanical device inside. I've seen similar things in some other escapes. I like it better when the events in the game, however absurd, could possibly occur in real life. Perhaps I will be attacked for demanding too much artistic verisimilitude. I loved this escape. It was a little on the easy side, but generally about as perfect as an escape game can be. Bravo! I've tried 3 different browsers (Safari, Chrome and Firefox) but can't get it to load or access the alternative link. Neither link is working for me, in either Firefox or IE. The main link is stuck at 75% and the alternative gets me a "page not found" message. I tried another game site (sorry, you are still the best) and their alternative has the same problem, so probably not your mistake. Just tried again, and main link worked. Must have been temporary issue. Thanks! I think Robamimi was going for a surreal effect with that. But the rest of the surrealism was much more slight so I could see how, in all the nature (tree, vines, grass, flowers) around you, you'd feel jarred when a non-natural event occurs. The symmetry clue had me staring at my computer screen far longer than I care to admit. Although I hated to do it I checked the walkthrough and got to the hint and figured it out. The walkthrough hint for the symmetry clue is basically the solution...not a hint at all. If I'd only used my dictionary. Anyway, nice game. Robamimi always seems to throw at least one curve ball in there. Everything else flowed rather smoothly. I had the same problem with a white box in firefox. The "altermative" ;) site link at the bottom worked for me though. Robamimi has to be one of my most favourite game developers - beautiful imagery and music :) I still haven't quite figured out the vine puzzle though sadly... how exactly does one 'trace' the flower back? Check out the vines and flowers on the wall outside the passage. It doesn't have anything to do with the "264" clue that got you into this hallway. (It looked similar to a mechanic I'd seen before, so I was stuck doing that for a bit). It doesn't have anything to do with the words Wonder Fruits Garden. In fact, the puzzle is completely self-contained outside of the clue you got under the fire. It doesn't have anything at all to do with where the letters are on the grid. Look at the letters themselves. I wonder... vertical, or horizontal? Look for symmetry in the letters. Look for horizontal symmetry in the letters. Highlight all the letters that are horizontally symmetrical. (Like M and T - but not like K). You do have to trace the flowers from the top of the wall to where they end up. Where does the "first" vine end up vertically? It's not the first flower you see from left to right!